On August 18, Darlington 1883 will play its first game in The Northern League, marking an end to a tumultuous year which started with Darlington FC going into administration on January 3. The journey from administration to becoming Darlington 1883 has been complex, but eight months since the saga began, the efforts of the Darlington Football Club Rescue Group in the early days of the saga have resulted in the new club starting the season with the ability to pay its own way, having a clear plan for its future growth. Andrew Cawkwell, Head of the Special Situations Team at leading commercial law firm Muckle LLP, advised Darlington Football Club Rescue Group and latterly Darlington Football Club 1883 Limited on its efforts to save the club. He got involved after Darlington MP Jenny Chapman invited him to attend a meeting of concerned local business people and fans who wanted to find a strategy for its rescue. Following that meeting the Darlington Football Club Rescue Group was born, and Andrew got to work with his colleagues within the Group looking at ways to help the administrator to carry on running the club, providing support and assistance to him and in identifying opportunities to sell the club to third party commercial bidders, so it could be taken out of administration. The Administrator, Harvey Madden, wanted to sell the business within 14 days, which meant the pressure was on, as the deadline for finding a buyer was January 18. Without any commercial bidders coming forward, the Darlington Football Club Rescue Group decided to hand £50,000 over to the administrator on January 18. Half of this was provided by the stadium owners and half was raised by the fans. This was a last minute bid to buy some time and keep the business trading. The Rescue Group then formed a newly incorporated company – Darlington Football Club 1883 Ltd. 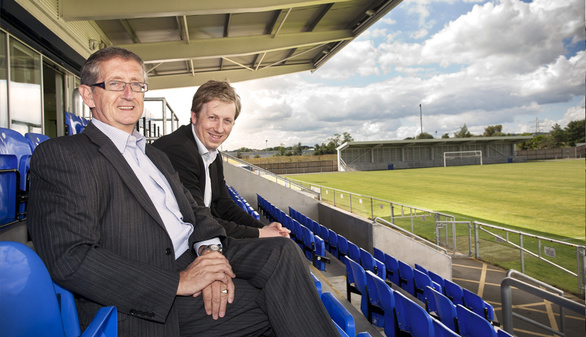 The new business was formed specifically to buy Darlington FC’s business and assets. The Group then began looking for ways to raise much needed capital to help secure the new club’s future. Working with an online crowd funded company, Darlington Football Club 1883 Limited set up an online platform to encourage fans to invest in the new company. When the exchange of contracts occurred on February 15, the new Darlington Football Club 1883 Ltd had exclusivity to complete the transaction on or before April 30, giving it time to complete financial due diligence, organise the lease of the stadium and complete the application to transfer the rights to play football with the Football League. One of the most complex aspects of the work was transferring the licence to play football so the new club could continue to play in the League. The Football League rules state that the shareholder of the club which holds the membership must give permission to transfer it to another company. To maintain the club’s standing in the Football League, the ‘old’ club also had to exit the administration into a Company Voluntary Arrangement (CVA) and pay all creditors. “It became impossible to find a way to resolve the issues over the Football League membership and satisfy the CVA before April 30 – which was the deadline for completing the deal. It was a very difficult time. Saving the club became uncertain,” Andrew explained. However, a compromise was found and the deal completed three days later on May 3. The terms of the deal meant that there was a ‘continuation’ of the old club. “If you can imagine the days that preceded that – it really was touch and go. But the transaction was completed and we now have a community owned football club,” Andrew said. As well as setting up the Darlington Football Club 1883 Ltd, Andrew and his colleagues have also set up a Community Interest Company (CIC) called 1883 CIC with 350 founder members. Safeguarding the new club was a key part of Darlington Football Club 1883′s plans, which is why a bespoke constitution was designed. Darlington 1883 has also moved away from the 25,000 seat stadium in Darlington and is ground sharing with Bishop Auckland this season. The club is set to be a giant in the Northern League. Pre-season friendlies have attracted up to 700 supporters – double the amount of people usually in attendance at Northern League games. Of the work rescuing Darlington Football Club, Andrew said: “This was completely different to my usual work. It was a very fluid, emotionally charged situation. The fans and other stakeholders were very emotional about the club – so it wasn’t like dealing with other businesses where decisions are made on a purely commercial basis. Harvey Madden, partner at Taylor Rowlands accountants, the administrator who worked closely with Andrew and the Darlington Football Club Rescue Group said: “Muckle LLP’s Special Situations team is uniquely placed to rapidly deploy specialist skills and experience to help rescue ailing businesses. For more information, help or advice on business in Special Situations please contact Andrew Cawkwell on 0191 211 7957 or email [email protected].